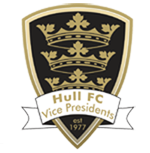 At our meeting last night the Vice Presidents were joined by Andy Last from Hull FC. Knowledgeable about all things rugby league, Andy gave a great insight into his role as assistant coach to Lee Radford. We also got to hear his thoughts on the upcoming Rugby League World Cup and his role as assistant coach to the Scotland team. Tough games lie in wait against Tonga, Samoa and NZ! We wish Andy well in Australia and let him leave early to iron his kilt!